A certain man from Bethlehem of Judah went to sojourn in the land of Moab (Ruth 1:1). 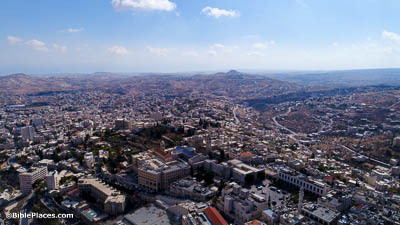 Bethlehem lies in the northern hill country of Judah. In the days of Ruth it was little more than an agricultural village, having no great significance or renown. Since then, however, it has seen a lot of growth and modernization, making it harder to imagine the town that Ruth and Naomi knew. They went into the country of Moab, and remained there (Ruth 1:2). 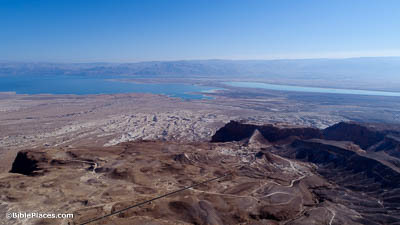 Moab is southeast of Judah, and the two regions are separated by the Dead Sea. There are two possible paths that Elimelech and Naomi could have taken as they traveled to the other side: a northward or a southward one. If they circled north, they would have moved up toward Jerusalem, over to Jericho, across the Jordan River, and then south toward Moab proper through the Plains of Moab. 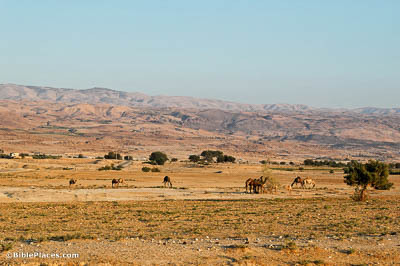 These plains, pictured here, are located on the northeastern side of the Dead Sea. 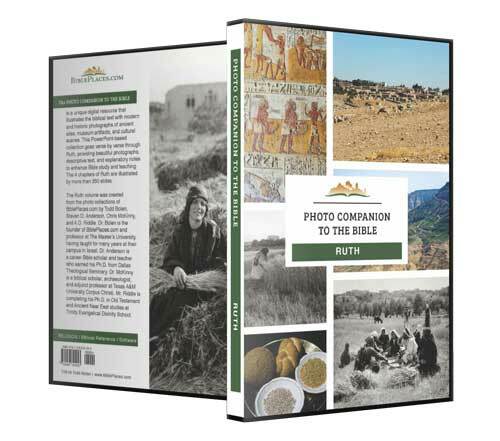 The author of Ruth does not record where Naomi’s family settled in Moab. Depending upon the extent of Moab’s territory at this time, the family may have settled either north or south of the Nahal Arnon. 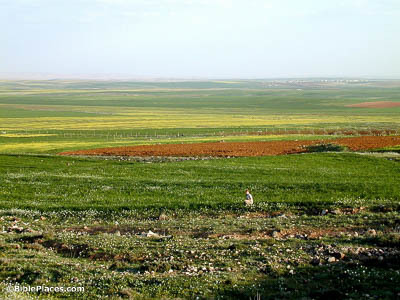 But regardless of the exact location, it was apparently a fertile area, like these fields south of the Arnon. The fact that the Gentile Moabites were enjoying sufficient rainfall while Israel suffered drought is a testament to God’s judgment on his people, brought on by their shocking immorality in the days of the judges. And they went on the road to return to the land of Judah (Ruth 1:7). On the return journey, Naomi and Ruth would have had the same choice of paths. If they decided not to circle the Dead Sea’s northern end, they could have crossed over the sea near its southern end. A piece of land called the lisan stuck out into the sea, creating a convenient crossing point opposite Masada. Nowadays the water level is so low that this crossing is completely dry, as can be seen here, but in Ruth’s day they may have needed a boat. Naomi said to her two daughters-in-law, “Go, return each of you to her mother’s house” (Ruth 1:8). 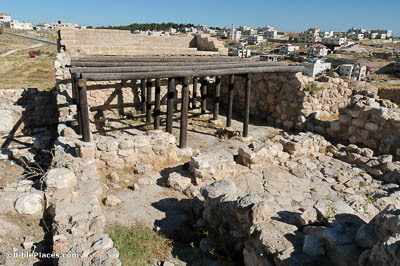 Given the length of time separating us from Ruth’s era (around the 12th century BC), we do not have many well-preserved examples of the buildings these women would have been familiar with. We do, however, have this well-preserved (and now reconstructed) structure from the Medeba Plateau, north of ancient Moab. It is one of the earliest four-room houses yet to be excavated in the Middle East, and it gives us an idea of what “home” might have looked like for the people in this story. And they came to Bethlehem at the beginning of barley harvest (Ruth 1:22). 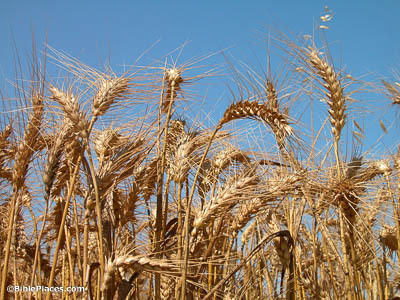 Though not as valuable as wheat, barley was still a popular and important crop in ancient Israel. Its hardiness allowed it to grow in places too dry for other grains, and its early harvest made it an important supply of food while people waited for the other crops to ripen. In fact, the barley harvest is the first harvest of the year, taking place in March or April, meaning that the bulk of Ruth’s narrative takes place in early spring.